Earlier this year, Sony mentioned that it was thinking about creating a PlayStation Classic console in the vein of Nintendo's recently released NES and SNES minis, which were smaller but more powerful versions of the original systems with an attractive library of games pre-installed with newly upscaled resolutions. Well, it looks like Sony has finally put those thoughts into action with the official PlayStation Classic, which was announced today with a December 3, 2018 release date and launch RRP of £89.99/$99.99 in the UK and US respectively. The PlayStation Classic comes pre-installed with 20 original PS1 games, and announced titles so far including Tekken 3, Final Fantasy VII, Ridge Racer Type 4, Wild Arms, and Jumping Flash. More will likely be revealed in the coming days and weeks, but you can vote in our ongoing Twitter poll to express which classic PlayStation games you'd like to see making a return via Sony's revamped console. 45% smaller than the PS1 and bearing a HDMI port for crystal clear, high-definition gaming, the Classic is packaged in a wonderfully retro box, which includes two original PlayStation controllers to plug into the ports where the system's memory cards would originally go (Remember those? Don't worry, a digital memory card is already built into the software). However, the only power option included is a USB-Universal cable, so you'll need to have your own AC adapter for actually plugging in and starting up the console from day one. 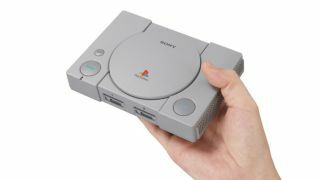 Given what we know about the retail woes of the SNES and NES Mini (though that was partly a result of Nintendo's ridiculously limited supply), you're going to need to pre-order the PlayStation Classic ASAP if you intend to get your hands on one by this Christmas. Sony has told any eager customers to stay tuned to PlayStation's website for incoming details about how to buy the Classic, and its regional availability, so the only thing you can do right now is wait for more details to come in, before hitting that pre-order button with every disposable digit you have. Interested in the PlayStation Classic? Catch up on history with our guide to the best PS1 games of all time before it launches this year.